June Fox Studio is filled with wall decals which are British wildlife themed. There's snakes, hedgehogs, frogs etc. They're so cute and educational for kids too! I know how realistic they look, they're quirky and different. I went for the toadstool ones, 'fly agaric' variety, which are the red and white ones which we're all familiar with. There's some facts about the toadstools on the packet which were interesting to read and the stickers look fab on my wall. They're really detailed, the print is amazing quality. 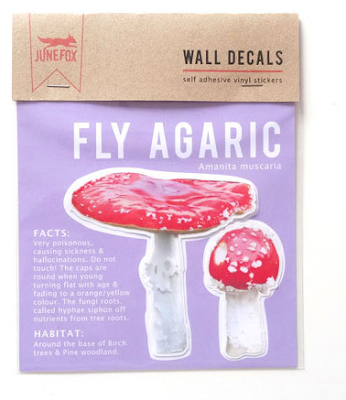 I'm so pleased with my mushroom stickers, definitely check out June Fox Studio for lots of cute wildlife themed decals.